Whether it’s regular or every so often, my Dog Walking service is flexible and built around your busy schedule, so whenever you need me I’ll be there for you and your pet. Having years of experience taking care of dogs, I know how to cater to their needs, keep them active and happy, and let them be themselves. With Hardy Hounds, you’ll be safe in the knowledge that your dog is being cared for by a professional who will give them the love and attention that they deserve. 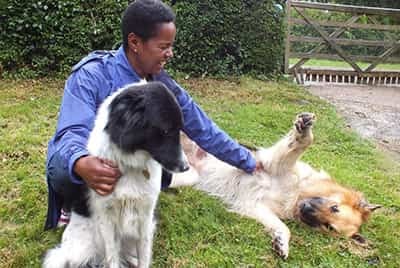 Based in Speldhurst, near Tunbridge Wells, and taking only a small number of dogs at a time, Angela Hardy of Hardy Hounds offers bespoke Dog Walking, Doggy Day Care and Cat and Small Animal services to pet owners on a regular or as-and-when basis. 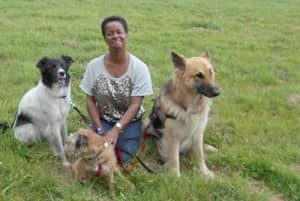 I have been walking and minding dogs for 6 years and have 30 years’ experience in caring for a variety of animals including horses, rabbits, chickens and cats as well as dogs. My priority is to make sure that all the animals I look after have fun, are happy and, most of all, are free to be themselves. My acre of garden, with a secure stock-fenced area, is the perfect place for your pet to run around, play with other dogs or just lie quietly. Whatever makes them happy. I have direct access to miles of countryside and woodland walks far away from busy roads, so your dog won't be bored and will get all the exercise and stimulation he or she needs. Whether that's having a good run, a good sniff, a good swim or simply ambling along! I am also available to visit rescue, nervous or more difficult dogs when their owners can’t be at home during the day, playing with them and giving them individual attention, so they feel more settled and happy in their environment. I pride myself on my flexibility, care and attention to detail and am always just a phone call, text or email away. No two dogs (or dog owners) are the same and I do my best to accommodate you and your dog's specific requirements meeting with you both initially to discuss everything in detail. If you are looking for a reliable and friendly pet care service that puts your needs first, then please don’t hesitate to call me on 01892 862738 or get in touch through my contact form. I am Enhanced DBS (Disclosure and Barring Service) checked, fully insured and a member of the Association of INTO Dogs. My husband and I are also Affiliate Members of the Kennel Club. You can be assured that your dog will be in the safe hands of someone who loves dogs and has years of experience with lots of different shapes, sizes, breeds and ages – from puppies to elders. My Cat and Small Animals service involves visiting your home once or twice daily to feed and look after your cats or other small animals while you are away. I am happy pick up pets for Doggy Day Care from the west Tunbridge Wells area including Rusthall, Langton Green, Poundsbridge, Bidborough, Penshurst, Fordcombe, Ashurst, Groombridge, Chiddingstone, Cowden, Blackham and Hartfield. My Dog Walking service covers the same area.